The thesis aims at investigating the interstices and overlaps between formal and informal urbanism. Historically, research into this field has typically been concerned with the upgrading and improving of the informal. This thesis provides a counterpoint outlook to this paradigm- rather its aim is to investigate the vast architectural potential that the informal has in assisting and contributing to existing formal frameworks. The thesis is framed as a response to the top down planning policies which are guiding the development of many Australian cities. Through presenting the inherent value of community and the right of the individual, this work proposes an alternative value system for dealing with urban renewal. 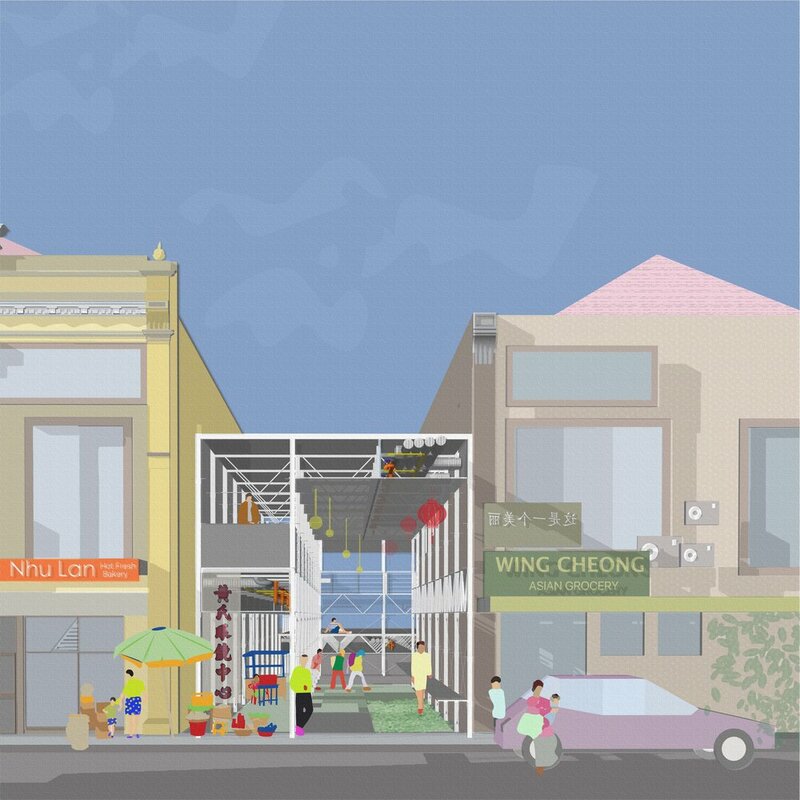 The project uses the suburb of Footscray in Melbourne as a case study for applying lessons we have learnt from our research into informal urbanism. Footscray was selected as it is a suburb which is, and has been host to one of Melbourne’s most multi-cultural and socially vibrant areas. It is a refugee receptor area- which means that throughout its existence, it has been allowed for many different types of communities to flourish and inhabit it. It is a suburb which already has demonstrated how informal urban approaches have generated a wholly unique and socially diverse environment. Essentially, Footscray itself acts as a stage for intense cultural appropriation. Waves of immigrant communities have altered and adapted the urban environment to suit their particular cultural practices and identities. It’s clear that Footscray provided the opportunity for migrants to recreate a culturally familiar place within a larger, mostly foreign landscape. This expression of culture becomes a means of validating one’s presence in the unfamiliar and further expresses facets of identity such as nationality and cultural distinction.However, it is this intense social livelihood which is currently being threatened by a primarily top down, formalist planning system- a system whose primary goal is to increase capital for developers, and allow for the abrupt insertion of new socio-economic classes. The case of Footscray is a case which has played out over and over again throughout Melbourne. Suburbs like Carlton and Collingwood are clear examples of this. As you move through Footscray’s public realm today, one begins to recognise a change in Footscray’s socio-physical landscape- one that is not additive but rather destructive of the suburb’s rich and diverse cultural-historical heritage. With recent urban renewal projects and the development of a number of high-rise multi- residential towers, the suburb is undergoing a process of rapid gentrification and transformation. These new developments are challenging its traditional ethnically diverse and working class character, promoting a lifestyle of ‘luxury’ apartment living. In order to truly understand the complexity of Footscray’s shifting urban landscape, we mapped it through the tools of observation and analysis. Rather than viewing Footscray as a singular condition, an approach often applied by many planning departments, our research aims at positioning the suburb as an assemblage of parts. Our analysis is a first attempt at trying to distill and explain some of the complex inter-relationships which exist between these parts in Footscray. The design ambition of our thesis was not to create a fully realised architectural object- but rather was an in-depth exploration into how architecture might be used to allow for individuals to play the largest role in the creation of their own urban environments. 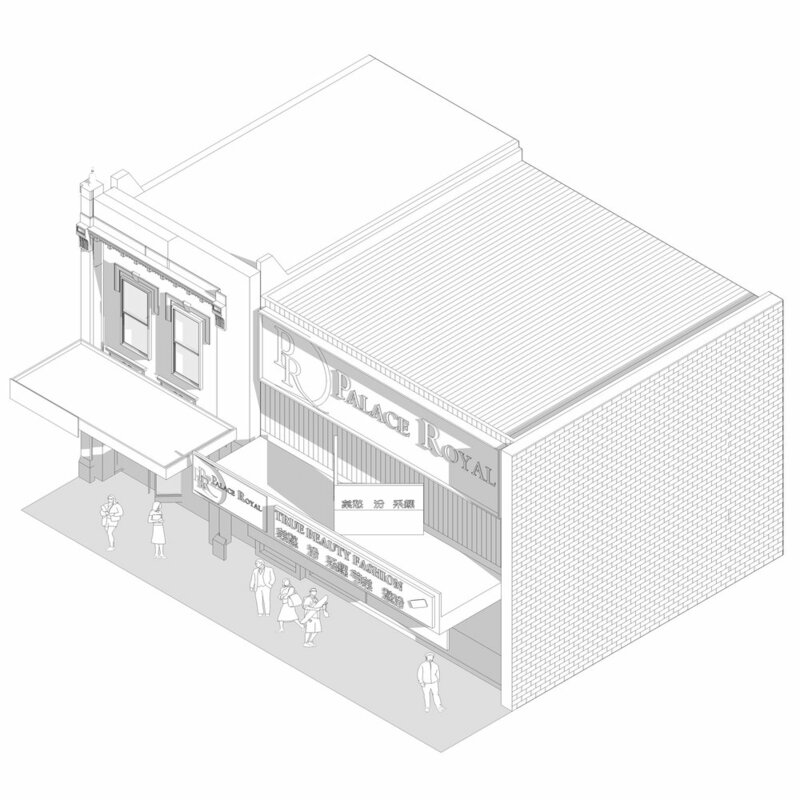 Our proposal applies the research we have undertaken into informal urbanism to Footscray’s central activity district. In this research we have attempted to distill the complexities of informal urbanism into a series of lessons as a first step in defining how an alternative way of thinking about architecture and urbanism might emerge. These lessons have dictated our design responses at multiple scales- with each lesson helping to inform a certain part of our proposal. The strategy begins by looking at Footscray at an urban scale- seeing how an architectural response could be used to enhance the positive aspects which already exist in the suburb, while also addressing the development and density needs of a suburb which is clearly undergoing imminent transformation. Instead of proposing some kind of land use plan or zoning plan, the idea of creating a network is used. This network aims at strengthening the already apparent connections between parts of the suburb, and developing a system which allows for incremental growth. The crux of the idea is that- if all of the separate elements of Footscray operate as a conglomerated network- the suburb will become more inter-connected; more entangled and related to itself, making it harder for developers to slice and dice the suburb. The multi scalar nature of the project meant that our architectural responses are intended to be read as part of a much larger network. Our buildings represent the next scale Throughout the semester, we have continually found it problematic to view our buildings as objects and exercises in architectural formalism. Looking at architecture through this lens requires a shift in the prevailing model of how architecture is conceived. Our buildings should be read as explorations into an alternative architectural model. Each of our sites contain a whole new set of complex inter-relationships. 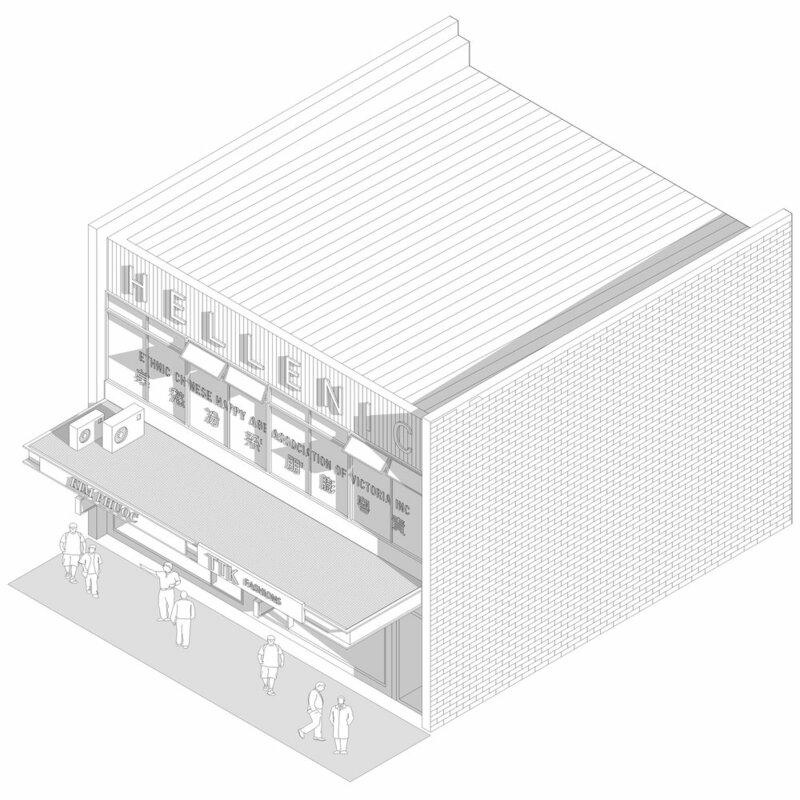 As such, each of our proposals employ different lessons of informality which we have considered appropriate. The Footscray Market acts as a microcosm of the suburb at large. Similar to the suburb, each store plays a part of a larger, inter-connected social network, whereby the market operates as an assemblage of individual elements. The market has a clear presence of Vietnamese traders, with other ethnic shops appearing scattered throughout. The upper floors of the market building are currently used as a carpark building. In it’s current state, the Footscray Market is Footscray’s most vital piece of social infrastructure- it acts as the beating heart and life-source to many communities in the suburb. The design of a community centre is used as a catalyst for the appropriation and incremental inhabitation of the upper floors of the Footscray Market building. The design of the building is viewed through a particularly urban lens. As Aldo van Eyck famously said; ‘A city is not a city unless it is also a huge house- a house is a house only if it is a tiny city’. The design of the building cannot be viewed as an isolated object, but rather as one part of a complex and shifting network of spaces. The Footscray Structure plan called for new social infrastructure in the suburb: namely flexible meeting spaces, art warehouses and community resource centres. The proposal intends to layer the existing piece of social infrastructure, the market, with additional social capital. The site to the right of the market building is currently occupied by a car rental company and temporary grocery business. In it’s current state, the site is under-utilised and congested- it is the vehicular point of entry into Footscray from the CBD. The site shares no relation to the existing fine grain nature of the market, and provides an opportunity to restructure how the Footscray Market building may operate. Instead of deal directly with the market itself, this under utilised site opposite provides an opportunity to kickstart how the market building might be used. The existing market building is intervened with an infrastructural street network, which services the incremental usage of the building and encourages intensive social interaction. 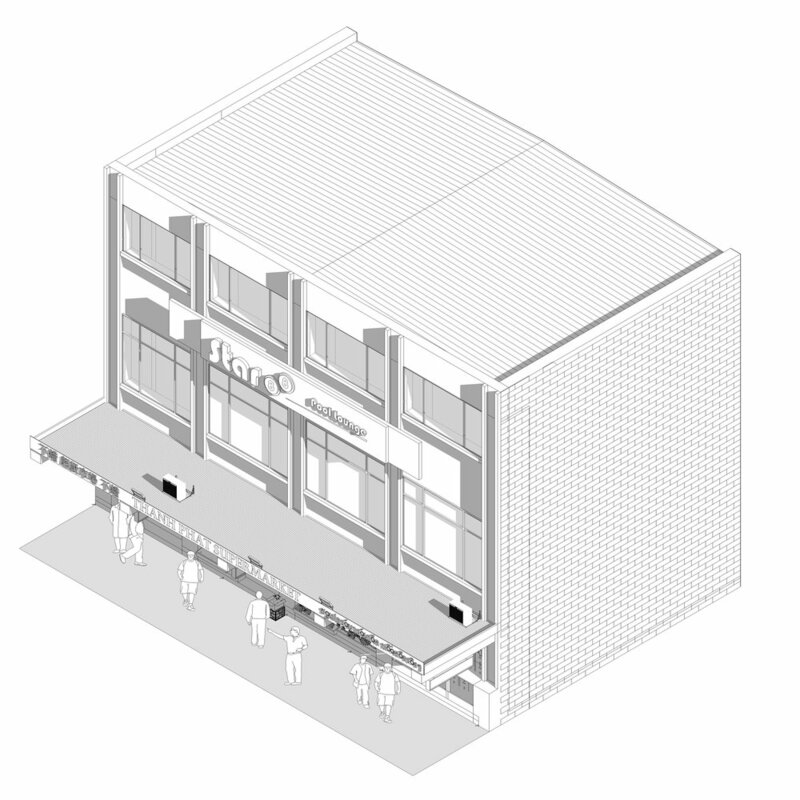 Through articulating the scale and proportions of each streetscape, interventions into the market building aim to drastically increase the visual connectivity of the existing design. While also providing circulation and access to the labyrinth of spaces in the building, it is through these public streets that light and air are able to enter the depths of the plan. Through designing how these streetscapes may intervene within the building, a series of ‘shells’ are able to be created which encourage incremental inhabitation. Simply by providing fixed architectural elements such as infrastructure, points of entry, access to light and air, the programme of these spaces are able to remain as indeterminate. As these spaces sit within a robust framework, the functions of these spaces are to change and morph with time. The insertion of a new piece of architecture is seen as only as a ‘catalyst’ project which kickstarts the appropriation of the market building. Through activating the corner of the site, the new building suggests how the shell of the market building may be appropriated over time. The building spills out into the floors of the market building- consciously blurring the boundaries between where one building starts and another ends. 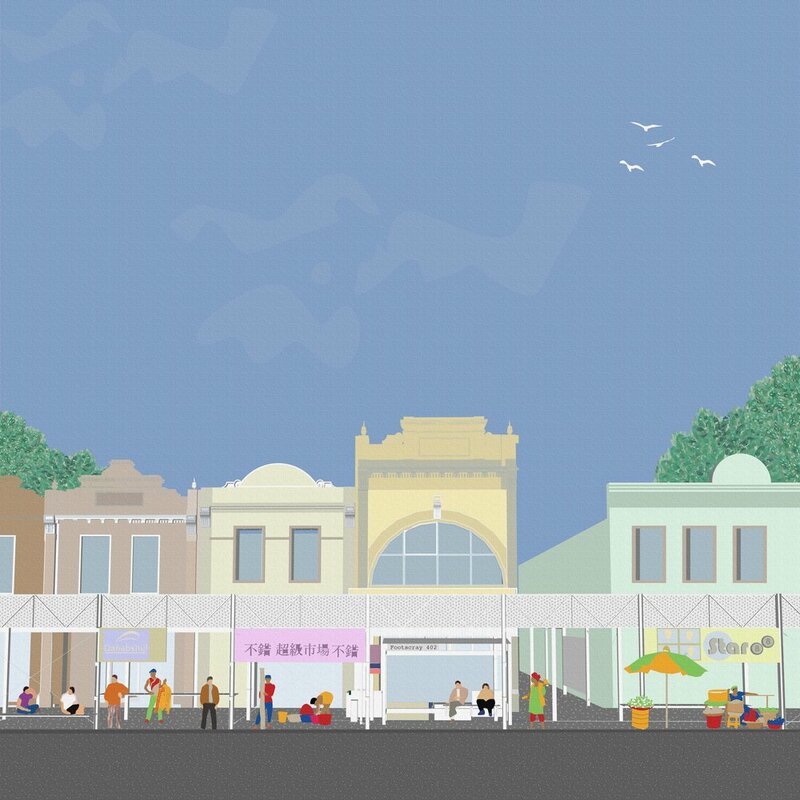 The first step in designing an intervention for the Footscray Market began with re-designing how the market, and consequential building would be serviced. A service zone is delineated against the existing market building- providing a centralised zone whereby vertical circulation, electrical and hydraulic services, and loading bays are clustered. A ‘Tartan Grid’ is used as an urban design tool to divide the existing structure into smaller inhabitable zones. This grid system services the building- containing the vital physical infrastructure which is needed for the building to operate, but also operating as a layered system of public streetscapes. The ‘Tartan Grid’ is used as an ordering system in the way the building itself is planned. Three types of circulation spaces are defined- each one flexibly accomodating for the range in the building’s programme. These circulation spaces continuously flow into one another- containing multiple points of entry and access. 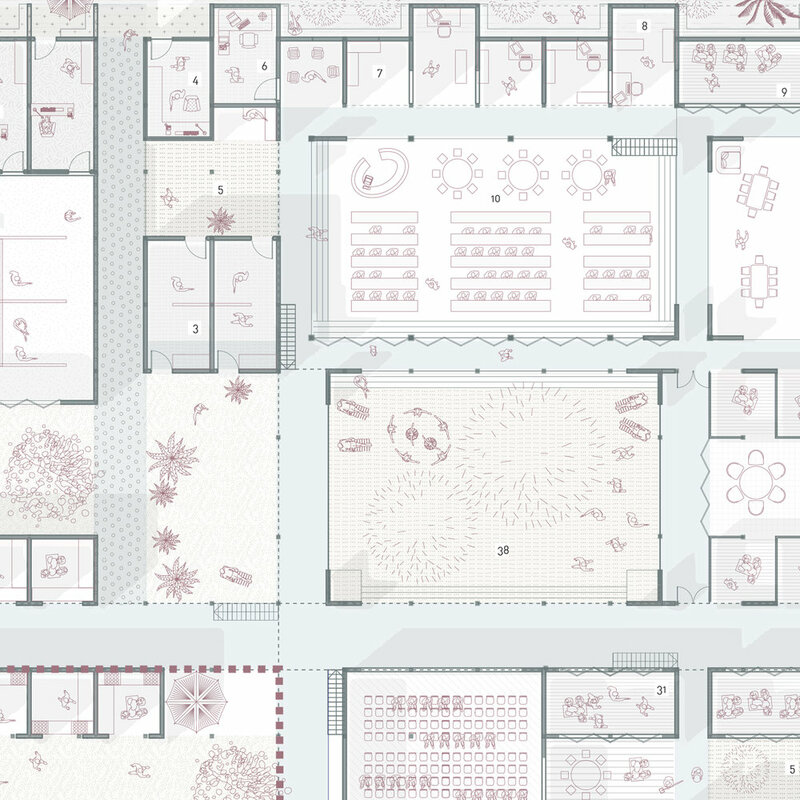 Through applying the network of streets upon the building, zones of inhabitation are set up. These spaces provide opportunities for appropriation and adaptation- allowing for individuals and communities to determine their programme and how they are utilised. The subdivision of the ‘Tartan Grid’ ensures that these ‘shells’ are able to accomodate for the incremental insertion of flexible functions over time. The implementation of an infrastructural system allows the market building to be inhabited in an infinite number of ways. Programmes are not defined, but rather are encouraged to be incrementally added. Importantly, the building is not viewed as an isolated object, but rather as one part of a complex and shifting urban network of spaces. The building is broken down into different volumetric shells which accomodate for different types of function. Without specifying the way in which the space should be used, each one of these volumetric shells encourage a certain pattern of inhabitation are able to occur over time. The robustness of these shells allow for the programme of the building to change over time. Instead of defining a roof form, the roofscape acts as an extension of the ground. The roof of each shell provides an opportunity for further incremental additions. As such, the building is always in an unfinished state of existence. These roofscapes also spill out into the market building and extend the public spaces of the street onto the building.